I have been musing of late around thinking about the algorithm behind self driving cars. For all you programmers out there – the self driving car is a great thought experiment on how to devise a technical solution to an existing problem (assuming you think humans driving cars is a problem). If presented with the problem – how would you attack it? Here were my thoughts. Assuming a car has over 20 different sensors, make each sensor responsible for a task – and each sensor elevates a recommendation to a central processor. For instance, ‘right front camera detects pedestrian on right’, and ‘front camera detects stop sign at 100 ft’. The central processor would then weigh the various inputs and make a decision on how to proceed. So that’s one layman’s thought. I ran across this video that has the answer on how Google approaches the problem. According to the video presenter, the algorithm first processes all the inputs, and detects known shapes, then calculates the various shapes predicted movements, then makes a decision. Google has invested a lot of money into machine learning, so it wouldn’t surprise me if their algorithm is more dependent on machine learning than say Tesla, BMW or others. The algorithm may also be different for self driving trucks, since their use case is more highway oriented, with fewer variations in objects, and hopefully more defensive. Also, self driving trucks will likely have podding technology, allowing trucks to virtually chain together to reduce wind drag and improve mileage. Whatever the case, it seems certain that in 5 years, when you buy a car, a significant factor will be ‘what operating system does it have?’. Will different operating systems make different moral judgments about what to do an emergency? It could also be that the best algorithm hasn’t even been designed yet, as we are in the early stages of this technological transformation. I hope all technology companies add the question ‘how would you design a self driving car?’ to its list of interview questions when hiring software developers. Seems like the ultimate programming problem of our day. Back in July 2015 I wrote a post about how Apple looks like the next Microsoft. I think the last year and a half as proved my theory to be on track, and I am seeing more and more articles in agreement. The latest comparison? In the early 2000’s, Microsoft was the leader in smartphones with its Windows CE platform. Along came Apple with a better product and pretty much killed it off. A few years ago, Apple had the lead with Siri, the voice virtual assistant that was far ahead of the competition. Now, Siri may be running a distant 3rd, behind Google Assistant, and more importantly Amazon’s Echo. How could Apple let Amazon take over the market for virtual assistants? Echo now has a huge number of partners, and this years CES was dominated by Echo. The Echo now has so many partners, I don’t see how Siri can catch up now. I heard an interesting theory as to why successful companies such as Microsoft and Apple find it so hard to follow up a big hit with a successor. The theory was that there are so many companies trying to find the next big thing, that it is rare for the same company to win more than once. And companies that have an installed base to maintain and monetize are further distracted from innovating by managing their existing product line. The theory assumes a fair bit of success involves plain old luck – though luck can be defined as ‘when preparedness meets opportunity’. So I will continue to watch this interesting parallel playing out with Apple. With all the big players in the consumer electronics market – I will be curious to see if Apple can find magic once again. Snap (SNAP), best known for it’s SnapChat app, is the latest tech IPO, the largest since 2014. I have never used the app, don’t really follow the company, and for the most part feel like most people that this is way overvalued and may end up with the same painful stock price route of GoPro. However, I did have a couple thoughts on yesterdays IPO. Yes, it’s likely overvalued, but they do have an innovative marketing angle which has the potential to unleash something big. Snapchat allows you to put various filters on the picture of yourself, to make it more amusing to whomever you send the picture to. 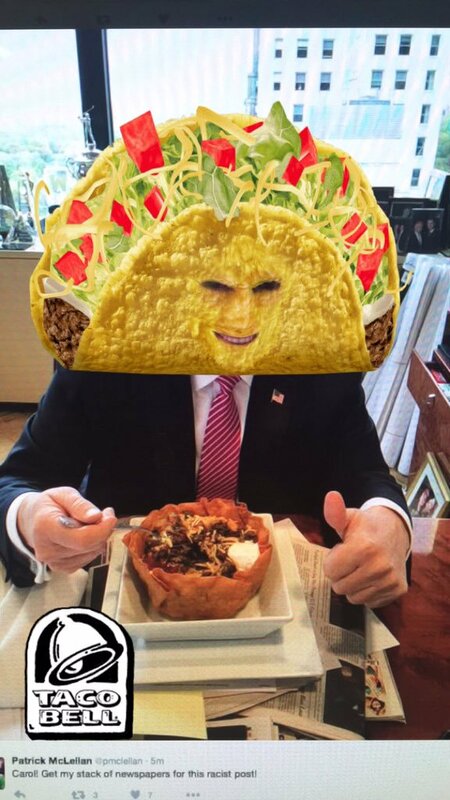 Key to this is their ability to support sponsored filters – filters branded to the company developing the filter – an example of which is the Taco Bell filter on the right. Sure, its kinda silly (but this whole app that they built a 33 billion market cap around is pretty silly), but as far as building brand awareness and ‘hipness’, it seems to me to be pretty unique. Any company looking to strengthen its relevance should find this more intriguing than any banner or pop up ad. Teenagers are the primary demographic for this app, so it would be an interesting ad choice when promoting a movie and its characters, or other product aimed teens. It is sure more interesting than TV advertising, banner ads or popups. It will be interesting to see if this gets traction, or if the founders of Snapchat find other innovations in advertising. Economist Steve Liesman of CNBC had an interesting offhand comment when talking about the IPO. He essentially stated this exemplifies what is wrong with the economy and why growth is so slow. Snap is a company getting a 31 billion market cap, bigger than Paccar and Nordstrom combined. Snapchat has 1,200 employees – Paccar and Nordstrom combined have 95,000. Snapchat has 550 million in long term assets (i.e. plant and equipment) – Paccar / Nordstrom have 9.5 billion in long term assets. The new economy requires very little capital investment – which is great for 1200 people, but it siphons away capital from companies that spread it across the economy. Maybe this helps explain why the Fed can’t get growth going even at near zero interest rates. I won’t be following Snap closely, but it may turn out to be in interesting story going forward. It will be interesting to see if this is the next Facebook or the next GoPro.